First, the claim of presenting “a new technique to identify the character of natural climate variations” is odd, as the techniques Humlum et al. use — Fourier transforms and wavelet analysis — have have been around for a long time. It is commonplace to apply them to climate data. 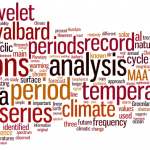 Using these methods, the authors conclude that “the investigated Svalbard and Greenland temperature records show high natural variability and exhibit long-term persistence, although on different time scales”. No kidding! Again, it is not really a surprise that local records have high levels of variability, and the “long-term persistent” character of climate records has been reported before and is even seen in climate models. The most problematic aspect of the paper concerns the Greenland temperature from GISP2 and their claim that they can “produce testable forecasts of future climate” from extending their statistical fit. Of course, these forecasts are testable – we just have to wait for the data to come in. But why should extending these fits produce a good forecast? It is well known that one can fit a series of observations to arbitrary accuracy without having any predictability at all. One technique to demonstrate credibility is by assessing how well the statistical model does on data that was not used in the calibration. In this case, the authors have produced a testable forecast of the past climate by leaving out the period between the end of the last ice age and up to 4000 years before present. This becomes apparent if you extend their fit to the part of data that they left out (figure below). I extended their analysis back to the end of the last ice age. The figure here shows my replication of part of their results, and I’ve posted the R-script for making the plot. The full red line shows their fit (“model results”) and the dashed red lines show two different attempts to extend their model to older data. For the initial attempt, keeping their trend obviously caused a divergence. So in the second attempt, I removed the trend to give them a better chance of making a good hind cast. Again, the fit is no longer quite as remarkable as presented in their paper. 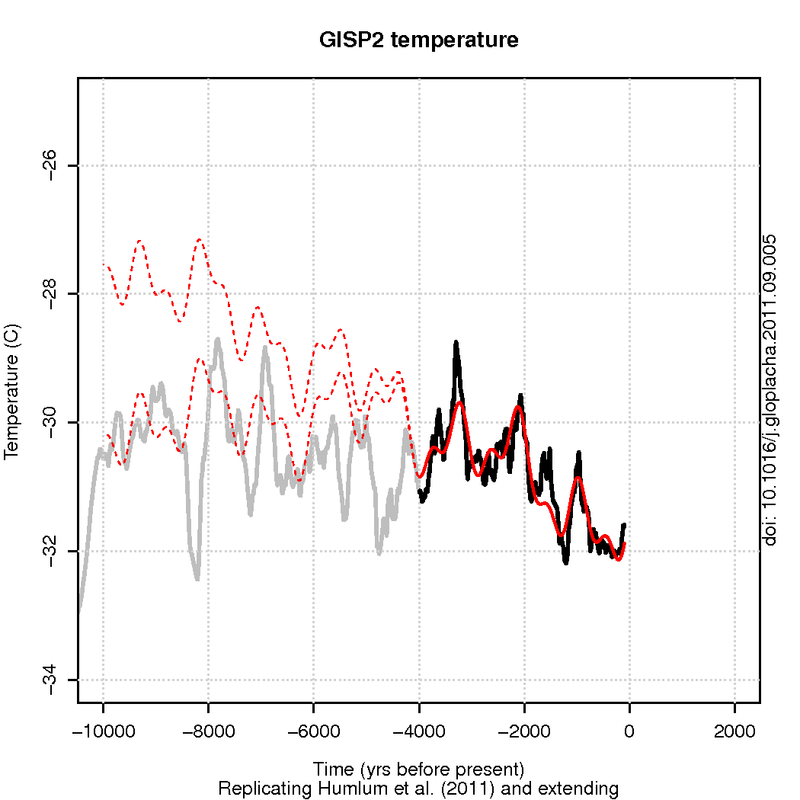 chose to focus on the most recent 4000 years of the GISP2 series, as the main thrust of our investigation is on climatic variations in the recent past and their potential for forecasting the near future. One could of course attempt to rescue the fit by proposing that some other missing factor is responsible for the earlier divergence. But this would be entirely arbitrary. Choosing to ignore the well known (anthropogenic) factors affecting current climate, on the other hand, is not arbitrary at all. We hypothesise that this may bring about the emergence of relatively warm or cold water masses from time to time in certain parts of oceans, in concert with these cyclic orbit variations of the Moon, or that these variations may cause small changes in ocean currents transporting heat towards high latitudes, e.g. in the North Atlantic. main focus is the identification of natural cyclic variations, and only secondary the attribution of physical reasons for these. So, if the curve-fitting points to periodicities that are anywhere near any of the frequencies that can be associated with a celestial object, then that’s apparently sufficient. You can get quite a range of periodicities if you consider all the planets in our solar system, their resonances and harmonics, see any of Scafetta’s recent papers for more examples. And of course, if there are parts of the data that do not match the periodicity you believe to be there, you can just throw it away to make the cycles fit. Quite easy really. In short, Humlum et al’s results are similar to those I discussed concerning meaningless numerical exercises, and their efforts really bring out the points I made in my previous post: arbitrarily splitting a time series up into parts generally does not allow one to learn anything. Polynom fit is otherwise Humlum’s speciality. I have seen it yesterday in arxiv. This is obviously some crap. I wonder how it managed to be published? This entire field of climate change is bringing out some interesting features of the scientific enterprise as currently practiced — namely in the evolving world of peer-reviewed literature. Could one of the RealClimaters comment on this journal (Global and Planetary Change) as a place for publishing climate modeling results? Since a number of this paper’s claims do appear to be embarrasingly wrong (“new technique…”), I find it hard to believe that, had this paper been subject to peer-review by the climate modeling community, the points rasmus makes in this post would have been made and the paper likely not published as is. Humlum seems to be another “Fun with Fourier” types. I wonder if they have ever undertaken the exercise of seeing how many periodic functions must be added to approximate a finite series. It is surprisingly few. It’s like they are claiming a great coup for fitting 4 points to a cubic polynomial. And once you throw in some noise, fuggedaboutit. Moral: Don’t let friends drink and derive. btw. Fourier transforms spectral analysis often gives misleading results, there are far better ways , see the last graph in the above link, no beloved ‘60 year cycle’ either in the global, N. hemisphere or the CET data sets. This is not the first time Humlum has produced various spurious claims. This is a shame. Humlum is a well respected glaciology/permafrost researcher. It’s sad to see him lowering himself to this level. This will be interesting if the prediction proves out, otherwise not. The upcoming 20 years will be rich with commentary, and comparisons, of the many predictions made to date. It will be one of the most exciting 20-year epochs in the history of science. #3 Global and Planetary Change is a legitimate scientific journal. It has a impact factor of 3.6, which is quite good. Many interesting papers are published there. It is probably a classical example of “tunnel effect”. Peer review is not 100% efficient. With the recent methane news, this makes a perfect storm for the author, unless he’s on his deathbed. He’s really set himself up for embarrassment sooner rather than later by making specific weather claims over a relatively short period with most real-world evidence pointing the other way. That the journal is credible and the author has expertise in related fields makes it worse. There are too many all-too-human scientists losing their minds in pursuit of the bubble reputation, money, or something. Unfortunately, given the readiness of the infotainment industry and their funders to seize this kind of stuff, it is, to put it mildly, counterproductive. Susan Anderson, To be embarrassed, the author would have to have some sense of shame. I suspect he is invulnerable. (3) Concluding that when these regions include some resonances that these relationships must be causal. First, their claim on page 146 that somehow the CWT (continuous wavelet transform) localizes in time and frequency better than the Fourier is incorrect: It suffers exactly the same kinds of Heisenberg-like uncertainty relationships. See, e.g., Lang, Forinash, “Time-frequency analysis with the continuous wavelet transform”, Am.J.Phys. 66(9), September 1998, 794-797. Second, there is no discussion of pre-filtering the finite series to minimize spectral leakage. Perhaps this is a function in the software they used, but it seems it should be mentioned. See, e.g., http://en.wikipedia.org/wiki/Spectral_leakage. This is a worse problem for non-stationary signals, and, at least in the Fourier case, it’s usually dealt with by using a moving window. Third, the LATERAL UNCERTAINTY in the frequencies of their lobes which are the basis of their extraterrestrial interpretations is significant. It’s made worse by uncertainty in their original data, which is clearly non-zero, and by spectral leaking, assuming it wasn’t compensated by filtering. Fourth, I think they really need to do the statistical test in terms of mean-square-error or something in the time domain, not in the frequency or wavelet domain. Using a white noise null is really a red herring. ANYTHING, ANY temperature profile is going to show significance against that. What they should do, I think, is estimate the uncertainty in the frequency domain, and jitter those spectra and see how the temperature profiles differ across a collection of jitters from the measured data. Maybe I’ll look more at this. Not a lot of spare time, though. If methane is venting on a fairly large scale, would this not indicate that a tipping point has been reached? Thank you Rasmus for clearing the air of rotten cherries and highlighting the latest red herring ‘something else’ argument. I wonder how long it will take someone to analyze the effect of earthquakes on Pluto and it’s affect on Earth climate? If I was a journalist coming into this posting, well-intended or not, I would be unimpressed with the use of language that (understandably) mocks the analyses and ideas of these authors. It does not help the case of the science community to come down to the same level – to use the same type of dismissive language – as disingenuousness skeptics use (e.g., to write paranthetically, No kidding! Or, Seriously! Etc.) Let’s maintain the high and respectful standard that our community is known for, please. I hope and trust that Rasmus and/ or someone will provide a formal rebuttal to the paper. I am not certain that analysis by O. Humlum et al. should be entirely dismissed. – O. Humlum et al. (page4, Fig.2) “The record is dominated by three periods of about 68.4, 25.7 and 16.8 years long. – According to the Arctic’s four centuries long geomagnetic profile there is, as yet not entirely understood, an apparent correlation to the solar activity, which is more likely to be the cause of any oscillations rather than the precession of the Moon’s orbital nodes. The same authors on the same research with alternative interpretation ? Humlum is a contrarian well known in Scandinavia, but fortunately not much outside – at least hitherto, so maybe it´s not worth the while giving him this attention. But, like e.g. Tim Ball or Ian Plimer, he is a classical contrarian in the sense that his own field (physical geography) is only marginally bordering climate science, and he has followed the well-trodden path of such people by authoring lots and lots of outrageous rubbish about global climate in the popular literature but (wisely) stayed clear of the scientific literature with that. Many of us have regularly tried to point out these obvious howlers directly to him on Danish climate blogs, but he has always failed to answer. I have tried a little test at my terrestrial ecology section (I´m a biologist), and every single student I have asked who were just passingly familiar with the carbon cycle, sources and sinks and basic isotopic facts, has immediately been able to point out the obvious weaknesses (e.g. “if the atmospheric CO2 rise came from oceanic outgassing, then why has oceanic CO2 risen too”?). I would like to ask Rasmus: Have you personal experience with Humlum? Do you honestly think he believes the rubbish he´s peddling? I must say that I don´t believe that a professor of physical geography like Humlum could honestly be ignorant about this or believe these arguments himself. My search: http://arxiv.org/find/all/1/all:+humlum/0/1/0/all/0/1 finds just one paper and it is not the paper discussed here. Mike Ellis, I disagree. Ridicule is a perfectly legitimate response to the ridiculous. I think humanity has reached a point where we must collectively realize that we cannot afford to suffer fools gladly. Your argument is in itself a red herring. You can wave the red herring of ‘those that call it like it is are just big meanies’ trying to bully those that are more interested in buying into bad methodology to support their own bias confirmation… but that just confirms for me that your argument is in itself a distraction from relevant facts in evidence. 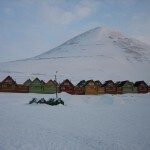 If the author is already peddling denialism based on limited facts used out of context, and this new paper is published likely just to be used as the latest red herring distraction in the global warming argument by examining “Svalbard and Greenland temperature records” in a too limited time span without relevant context, which, just in case some may not have noticed does not represent the region known as planet Earth, uses too short a time span in relation to mechanism outside of the examined region because it is in fact a regional analysis; one is left with a reasonable conclusion that the paper is designed to be precisely what I suspect it is designed for, to be a red herring distraction in the argument between science and science denialism regarding global warming. As usual Ray has properly hit the nail right on the head. – Ridicule is an appropriate response to the ridiculous. It is not required to go to any esoteric numerical simulations to conclude that the temperatures in North Atlantic / Nordic Seas ‘may’ go down in the next decade, as shown here: . But remember the Lesson of the Street. bystanders won’t know which of you is the crazy one. A climate model based on curve fitting is going to be wrong, because AGW produces weather that we have not seen before. On the other hand, computer simulations of climate that do not include carbon forcing and ice dynamics are also going to be wrong. For stakeholders, it does not matter why a model is wrong. All that matters is the accuracy of the final answer. AR4 missed the time frame for system changes that caused the Arctic sea ice retreat and all of the follow-on feedback cycles (e. g., CH4 releases from the Arctic sea bed). If the computer models (and AR5) significantly understate the time frame or effects of AGW, then it really does not matter whether stakeholders read computer model output, the latest drool by a curve fitter, or the Farmer’s Almanac. In each case, the effect will be poor policy and bad planning. Your missing my point, the issue here is the ability of a scientist to use a cherry picked piece of science as a case against global warming, not regional variability in relation to natural variation. That aside, what is the CI on the assertion that “temperatures in North Atlantic / Nordic Seas ‘may’ go down in the next decade”? When dishonesty prevails and threatens humanity, it is necessary to use anything and everything that comes to hand. Especially with those who wish to distract from the excellent scientific discussion that should otherwise prevail in this field. Humor is also soothing to the soul of those beleaguered souls who work very hard to get real news and real science out to a public that mostly would prefer to ignore it and hope it will go away. There are a few mosquitoes here who have discovered they can get people to swat away rather than hiking up the rather steep trail, as well. Per Luntz et al., distract and vilify works to delay. Unfortunately, we do not at this point have time for this slick anti-sense. Confidence intervals, Bayesian or otherwise, may be of interest to statisticians, which I am not, my background is in engineering, hence I look to physical principles as an evaluation of, not numeric probability, but a consequential possibility. Susan, When dishonesty threatens humanity, it is necessary only to use the most powerful of weapons–the truth. It is difficult to wield, sharp as a razor on all sides, but those who have mastered it cannot be vanquished. 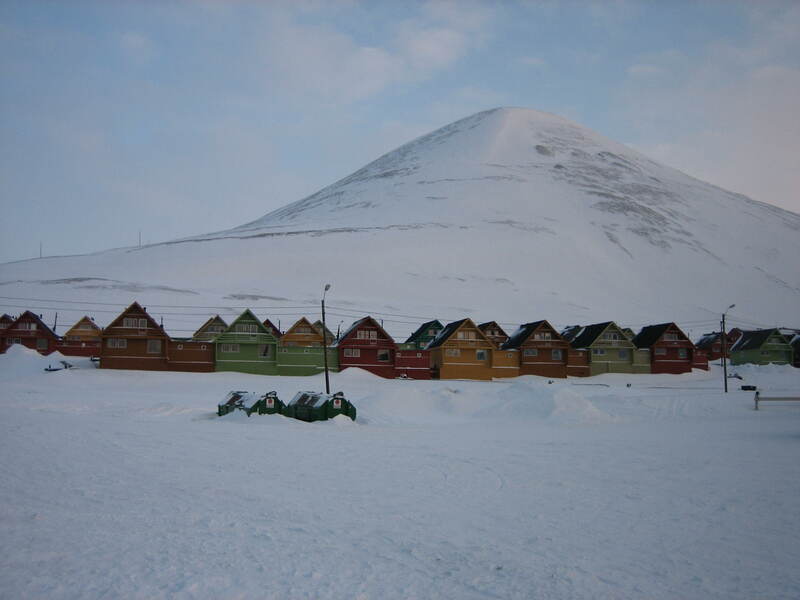 Among other things, it would be nice to know what four meteorological stations in Svalbard were used to to construct their “composite” temperature record. Furthermore, how was the composite constructed? In three of their figures (1, 4, and 5) three different time periods are used to smooth mean annual air temperature. Why? Lots of questions. Ray–Nice sentiments, but the truth has often been vanquished. On a happier note, that doesn’t mean the truth still isn’t out there for some future person or society to refind and eventually establish. Clearly a typo in my first submission! Sentence should read Forland, et al, 1997! You’re writing for the longterm audience, not the present conversation. When you get into an argument with a crazy person, passers-by can’t tell which of you is crazy. Looks like an advanced case of pareidolia. This “it’s natural” stuff seems to be fashionable among deniers at present. Guess the “no increase since 1998” stopped working for them. Leaving everything else about physics climatology ecology oceanography etc aside, the idea that it is just pure chance/coincidence that we have had such a rapid increase in temperature in last 30 years is the most extreme example of wishful thinking the world has seen. In other news, the Fox News goons are pimping a new version today of the “Phil Jones hid data from me that I could get elsewhere” story. Climate-not-a-gate’s weaker sister carries on. I believe what they used is identical with the “Svalbard Lufthavn” record available from eKlima. At least y chart of that looks like Humlum et al.’s. The actual “Lufthavn” record goes back to 1975, but the composite record going back to 1912 presumably also includes the “Svalbard Radio” station (compare this). I wonder what mistakes this one contains. If you role a dice, there is an equal chance of any integer between 1 and 6. Repeat 50 times, twice in separate columns. Very likely there will be no relationship between the two columns of numbers, however, it is likely you will find sequences which do match up. On my first attempt from row 31 to 39…..Wow, a linear correlation which can explain 81 % of the variance, what’s the chance of that? And if each roll of the dice represents 3.33 years, then we have 30 years. This does not prove that you are wrong, or that climate change is random rather than deterministic, but is does prove that it could be random. Waiting for more data is controversial, but the longer the series the less chance it is random. But even then you would have to prove that climate change is determined by humans, rather than some other deterministic cause. Re: David Horton @34 This “it’s natural” stuff seems to be fashionable among deniers at present. Guess the “no increase since 1998″ stopped working for them. I was just commenting on this pair of denier arguments of at Skeptical Science. The two are mutually exclusive. The “no increase since 1998” argument depends on assuming that CO2 is the only factor affecting temperatures, so any reduction in the rate of increase is evidence of failure of AGW theory. The “it’s natural variation” argument depends on the assumption that there are lots of other factors (known or unknown) that affect global temperature, so there is no reason to think that CO2 has any effect at all. JGarland, The truth has setbacks, but it does eventually win. An edifice of lies has within it the seeds of its own destruction, however grand it may look. Eventually, contradictions pile up and all but the most ideologically blinkered either die or abandon the lies. Nature will keep giving us the same answers. She will even turn up the volume if we do not listen. Eventually, the truth cannot be denied–which is fortunate, as in science,the truth is all we have or we aren’t doing science. The decision about whether to wait for more data can also be made scientifically. One must look at the consequences of waiting vs. the consequences of making a decision with imperfect data. We are long past the point where each additional day puts us further and further into the hole. It is simply foolish to bet the future of civilization on a 20:1 longshot. General comment: The truth always wins… the same can not be said for us. You left out a very important variable, called TIME! 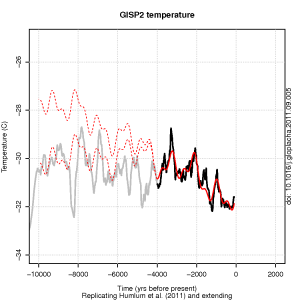 Is it possible that random internal variability can cause temperature trends? An Internal Combustion Engine Analogy. Let an engine w/ temperature operating at 107 deg C @ 2350 rpm undergo the following random rpm changes @ 1 min intervals. A change in 50 rpm equals a 1 deg C change, and requires 1 min equilibrium time. Only if you choose mathurbation over the empirical evidence and the physics, which a good many people are all too willing to do. No, Isotopious, it’s not some kind of dice throwing exercise, it’s a sudden sharp rise in temperatures after thousands of years of relatively stable ones, at precisely time CO2 levels in association with population and industrial growth also sharply rise. I don’t know how you would calculate the odds of such a “coincidence” being due to “chance” but you certainly wouldn’t do it by a few coin tosses. Thanks guys, I feel much better now. Though truth sometimes loses out, the alternatives to truth are worse. The sequence of rolls of loaded dice is random, even if you lose twice as often as expected. How much has the additional 110ppmv CO2 loaded the weather dice? Wanna bet whether the effect is linear? Random events, or loaded dice – and how much are we betting against Nature’s house?